ORLANDO, Fla. – March 27, 2018 – ProfitSword, a leading developer of business intelligence and data integration software for the hospitality industry and related vertical markets, is announcing its official market expansion to offer solutions to the senior living industry with its participation in HealthTAC East 2018. Taking place April 9-11 in Miami, Fla. at the Trump National Doral Miami resort, this key industry event is focused on bringing senior living industry suppliers face-to-face with key decision makers. ProfitSword will be accepting meetings with attending companies to gain insight on enhancing standard data management processes in the senior living sector and to provide information on potential solutions. ProfitSword offers a multitude of solutions to help businesses better manage data. Offering several business intelligence software applications, each solution was developed to create a user-friendly and efficient tool to help business professionals better manage their data for reporting and faster decision making. ProfitSage, ProfitSword’s operational and financial reporting solution, provides professionals with a user-friendly tool that integrates with standard business operation platforms for data collection and management. Through the use of ProfitPlan, senior living companies can incorporate stylized report templates to properly manage several types of reports, including business and marketing plans, monthly financial summaries, weekly commentary reports, annual budget comparisons and revenue strategy reports. ProfitSword’s data analysis tool, ProfitWizard, was developed as a combination of business intelligence, decision support, performance management and ad-hoc reporting for efficient analyzing of data. 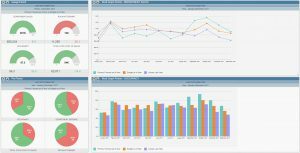 For more information on ProfitSword’s portfolio of business intelligence optimization tools, please visit www.profitsword.com.